The purpose of the current work was to prospectively measure the influence of testicular radiation dose on hormone levels, quality of life (QoL), and sexual functioning following multimodal therapy (neoadjuvant radiochemotherapy, surgery, and adjuvant chemotherapy) for rectal cancer. 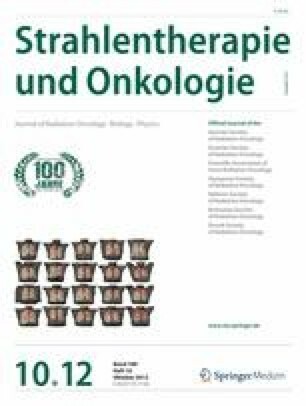 From November 2007 to November 2009, 83 male patients were treated at the University of Goettingen with radiochemotherapy (RCT) for locally advanced rectal cancer [total dose 50.4 Gy, concomitant chemotherapy with two cycles of 5-fluorouracil (FU) or 5-FU and oxaliplatin]. Testicular radiation doses were analyzed and correlated with hormone levels [luteinizing hormone (LH), follicle stimulating hormone (FSH), total testosterone and free androgen index (FAI) serum levels], QoL, and sexual functioning, which were determined before and up to 1 year after RCT. Mean dose at the testes was 3.9 Gy (range 0.28–11.98 Gy). It was higher for tumors located < 6 cm from the anocutaneous line (p < 0.05). One year after therapy, testosterone, the testosterone/LH ratio, and the FAI/LH ratio were significantly decreased (3.5–3.0 µg/l, 0.9–0.4, 7.9–4.5, respectively) while LH and FSH (4.2–8.5 IU/l, 6.0–21.9 IU/l) were increased. QoL and sexual functioning were significantly impaired. However, there was no statistical correlation between testicular radiation dose and changes in hormone levels, QoL, or sexual functioning. Multimodal treatment for rectal cancer including RCT leads to hormone level changes and to impaired QoL and sexual functioning. However, because there was no apparent correlation between the analyzed parameters, QoL is probably also influenced by other factors, e.g., psychosocial aspects. H. Christiansen and R.M. Hermann share senior authorship. Die vorliegende Arbeit untersucht prospektiv den Einfluss der Strahlendosis am Hoden auf Hormonstatus, Lebensqualität und Sexualfunktion bei Männern nach multimodaler kurativer Therapie (neoadjuvante Radiochemotherapie, TME und adjuvante Chemotherapie) lokal fortgeschrittener Rektumkarzinome. Von November 2007 bis November 2009 wurden 83 männliche Patienten an der Universitätsmedizin Göttingen mit einer neoadjuvanten Radiochemotherapie (RCT; Gesamtdosis 50,4 Gy; begleitende Chemotherapie mit 2 Zyklen 5-Fluoruracil (5-FU) oder 5-FU und Oxaliplatin) bei lokal fortgeschrittenen Rektumkarzinomen behandelt. Die Dosis am Hoden wurde analysiert und mit dem Hormonstatus [luteinisierendes Hormon (LH), follikelstimulierendes Hormon (FSH), Testosteron und dem freien Androgenindex (FAI)], der Lebensqualität (QoL) und der Sexualfunktion vor und bis zu einem Jahr nach RCT korreliert. Mittelwert der Dosis am Hoden war 3,9 Gy (0,28–11,98 Gy). Die Hodendosis war signifikant höher bei Tumorlokalisationen < 6 cm ab ano (p < 0,05). Ein Jahr nach RCT waren das Testosteron, der Testosteron/LH-Index und der FAI/LH-Index signifikant verringert (jeweils 3,5–3,0 µg/l; 0,9–0,4; 7,9–4,5), LH und FSH (4,2–8,5 IU/l; 6,0–21,9 IU/l) waren gegenregulatorisch erhöht. Die QoL und die Sexualfunktion waren signifikant verringert. Es fand sich allerdings keine statistisch signifikante Korrelation zwischen der Hodendosis und dem Hormonstatus, der QoL oder der Sexualfunktion. Nach multimodaler Therapie lokal fortgeschrittener Rektumkarzinome kommt es zu Veränderungen der Hormonspiegel sowie subjektiver Einschätzung der QoL. Es konnte jedoch im untersuchten Kollektiv keine statistisch signifikante Korrelation zwischen den untersuchten Faktoren gefunden werden. Möglicherweise ist die subjektive Einschätzung der QoL von weiteren Faktoren abhängig, die auch im – objektiv nur schwer messbaren – psychosozialen Bereich angesiedelt sein könnten. This work was supported by the German Research Society (DFG, KFO 179). The study results were presented as e-poster at the 2010 DEGRO (“German Society for Radiooncology”) Annual Meeting in Magdeburg, Germany.